Over the last 13 years skywatchers have had the opportunity to watch the world's largest man-made object in space, the International Space Station, take shape. As the space station gradually grew in size, observers here on Earth could see it become steadily brighter as it sailed across the twilight sky. Occasionally, it would be accompanied by a second object, usually the space shuttle, ferrying astronauts and cosmonauts to the station or back to Earth. With the construction of the space station finally completed this summer, as well as the end of the 30-year-old space shuttle program, attention now turns to a new space facility currently orbiting the Earth. Longtime satellite observers may recall when, in late November 1998, the first segment of the International Space Station, "Zarya," was launched from Russia. The spacecraft soon became visible as a bright "moving star" in the sky. Now, in a similar fashion, Tiangong 1 is visible as a bright, starlike object tracking across the sky. Tiangong 1 is expected to be joined soon by three separate unmanned Chinese spacecraft — Shenzhou 8, Shenzhou 9 and Shenzhou 10 — that will mark China's first attempt at docking maneuvers in space. Shenzhou 8 is expected to be launched on a 12-day mission sometime in November, while Shenzhou 9 and Shenzhou 10 are scheduled to lift off during 2012. One or both of these latter missions may carry the first astronauts to Tiangong 1. The International Space Station orbits Earth in a 51.6-degree inclined orbit, 233 miles by 248 miles (376 by 399 kilometers) high and is visible from 95 percent of the inhabited land on Earth. China's planned orbit for the Tiangong 1 space lab after launch a 350-kilometer path around Earth. But Tiangong 1 orbits Earth at a somewhat lower inclination of 42.8 degrees and at a lower 122-by-214- mile (197 by 345 kilometer) altitude. As such, it is visible from about 80 percent of inhabited land areas. For places north of about latitude 60 degrees north, Tiangong 1 will never rise above the horizon to be visible. This includes much of Alaska, the northern half of Canada, Iceland, Norway, Sweden and Finland. And for places just a short distance farther to the south, such as Juneau, Edmonton, Dublin and Copenhagen, Tiangong 1 will never get very high above the southern horizon; an altitude of less than 10 degrees (the apparent width of your clenched fist held at arm's length). But for those regions of the globe between 42.8 degrees south (near Christchurch) to 42.8 degrees north (near Boston), Tiangong 1 can occasionally appear to arc high across the sky, even passing directly overhead at times. Truth be told, on any clear evening within a couple hours of local sunset and with no optical aid, you can usually spot several orbiting Earth satellites creeping across the sky like moving stars. Satellites become visible only when they are in sunlight and the observer is in deep twilight or darkness. This usually means shortly after dusk or before dawn. What makes these upcoming passes so interesting is that you'll be able to see China's first space laboratory module, which is expected to set the stage for the future of that country's ambitious space program — an important part of China's stepping-stone strategy to human spaceflight. This week, it should be visible at dusk as an evening object across most the United States and southern Canada, as well as southern Europe. And this is a sight that should be easily visible to anyone, even from brightly lit cities. Tiangong 1 was observed on Oct. 1 by veteran Italian satellite observer Simone Corbellini who said its "brightness (was) steady at about magnitude 2; easily visible with the naked eye." Magnitude 2 is as bright as Polaris, the North Star, on astronomers' brightness rating scale, where brighter objects have lower magnitude numbers. 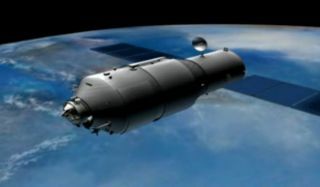 Some have suggested that Tiangong 1 could shine as bright as a star of first magnitude, which would rank it among the brightest stars in the sky. Each will ask for your ZIP code or city, and respond with a list of suggested spotting times. Predictions computed a few days ahead of time are usually accurate to within a few minutes. However, they can change due to the slow decay of the object's orbit, so check frequently for updates. Another great site is this one, which provides real-time satellite tracking and shows you at any given moment during the day or night over what part of the Earth the International Space Station happens to be. Perhaps the biggest oddity surrounding Tiangong 1 deals with music. On Sept. 29, Chinese state broadcaster CCTV and the Chinese space agency collaborated on a short video to mark the liftoff of Tiangong 1. The 98-second video gave an animated look at the launch and China's plans for a possible space station — all set to an instrumental version of "America the Beautiful." China's first space laboratory module, Tiangong 1 (Chinese for "Heavenly Palace") blasts off from the Jiuquan Satellite Launch Center on Sept. 29, 2011. The module will fly a 2-year mission for docking tests. Why? Nobody seems to know. Even the CCTV propaganda department was unable to provide an answer. "The spacecraft is too faint to be seen with the naked eye, but could be heard on 20,009 megahertz broadcasting the song 'Tung Fang Hung' (The East is Red), the semiofficial anthem of Red China." Editor's note: If you snap a great image of China's Tiangong 1 based on the skywatching website data above and would like to share it for a possible image gallery or story, please contact managing editor Tariq Malik at tmalik@space.com.